Create more of a timeless look and add more definition to your face with a distinct high bridge. 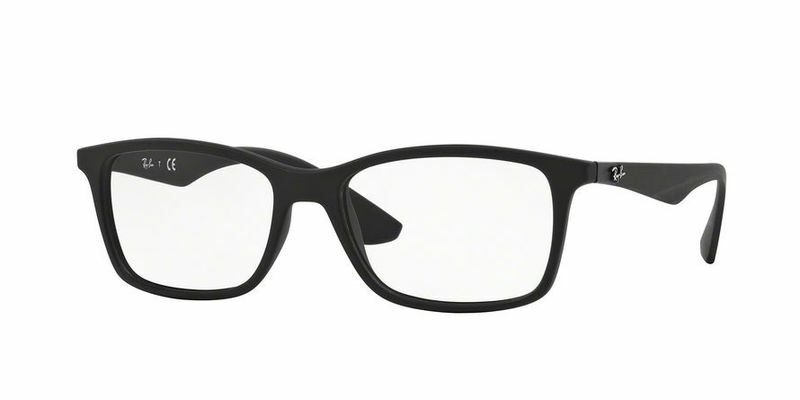 These plastic Ray Ban RX7047 eyeglasses have been created with a careful blend of plastics, ensuring the highest quality lightweight eyewear for you. The use of a number of plastics isn't accidental, and the final result is a unique pair of plastic eyeglasses that will help carve out your own individual style. Fully rimmed eyeglasses' Ray Ban RX7047 frames are perfect if you want to make a statement with your eyewear while fully protecting your lenses. You were born to stand out, and this is what you'll do with these rectangular frames, which are perfect for rounder or oval faces. Their soft rounded edge is subtle, which helps to soften the face and accentuate your best features (your eyes) at the same time. These casual frames are what you need if you're a bit of a free spirit who likes to go with the flow. Throw on your favorite pair of blue jeans and top it off with a pair of casual looking glasses and show the rest of the world you can be both stylish and carefree at the same time. If you have a rounder face with few angles, opt for angular shaped Ray Ban RX7047 frames like these with higher tempers to create a greatly desired longer profile. Great company and product ,very satisfied with the transaction . Thank you . I won't lie I was a little skeptical ordering because of the cheap price compared to everyone else but I took a chance and I�m SO glad I did. The glasses are great and for the fact that they're Ray Ban's along with my added prescription it came to a fraction of the cost I would have gotten them anywhere else. Shipped just over a week after I ordered them and they arrived the same day I received the shipping notification. Highly recommend! I am actually amazed at the quality and price of this product. Was skeptical at first, but they are actually awesome.